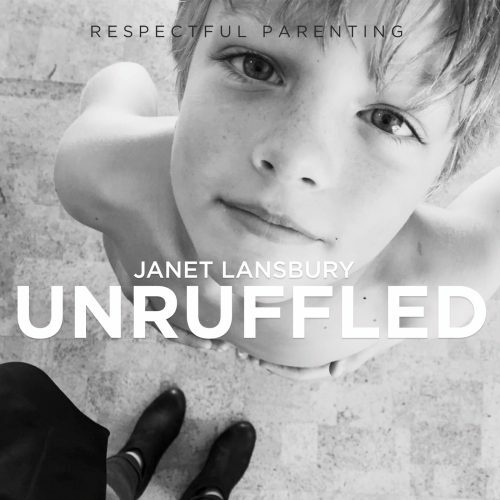 Hi, this is Janet Lansbury welcome to Unruffled. Today I’m responding to a parent who woke up in the morning to find the exterior of her husband’s car severely damaged by their five-year-old son. And this mom says that both she and her husband are too furious to speak with their boy about the incident. They’re asking for some advice about the right approach to take. Okay, I hope this advice isn’t too late for these parents, I hope this is helpful. I have to say that sometimes when I’m considering addressing a certain parent’s concern in a podcast or in an article, I actually start imagining the criticisms and backlash I’m going to get. And, in this case, I’m imagining that, one, people will be shocked that I am not suggesting a punishment for this behavior and, two, that I will be accused of blaming these parents for what their child did. Only the first of these two criticisms is actually true. I love that these parents are reaching out for help for this situation. It is such a good sign and, no, this is not their fault that their child did this. However, the incident is a reflection of something that’s going on in this family and the condition of the relationship that they have with their son. When children behave in a manner that they know is not welcome by us, it a reflection of their discomfort and disconnection. And when it escalates to something this serious and intentional, that means there is a lot of disconnection here that this child is feeling. It’s very uncomfortable to be a child who would behave in this manner. It’s a big call for help. I want to talk a little bit about connection vs. disconnection, what that really means. It doesn’t mean parents aren’t spending enough time with their child. It doesn’t mean that parents don’t care about their child, or that they don’t love their child. It doesn’t mean that parents are too strict. What it means is that our child doesn’t feel seen and accepted by us. They have uncomfortable feelings and they feel alone in these feelings. It’s a scary place to be. The first thing I would do generally in these situations is physically stop the behavior. Make this look as comfortable and easy as you can — matter of fact — just stopping them. We’re still much bigger and stronger than our children. And then, ideally, we notice, “Wow you feel like hitting. That made you want to hit when I said that, when I did that.” We notice and actually accept the feeling behind that behavior. I think we can all relate to feeling like pushing limits or doing inappropriate things. Children feel like this much more often than an adult would. Their cognitive development is not on par with the maturity of their prefrontal cortex, which means their ability to exert self control… that part is very immature and takes years to develop. They need to feel safe, not only physically in that we’re going to stop them, but even more importantly, safe in their own feelings of lashing out. It’s safe for you to have that feeling of hitting me. I’m here to stop you. I almost want to say to parents sometimes to not necessarily to say out loud, but to have the thought themselves, “Don’t worry I’m not going to let you hit me.” Because that will help us be in a helpful attitude that is calming, that is giving our child the messages that he or she needs in these moments. Now most of us are able to do that a lot of the time, but there are also a bunch of other feelings children express that get away from us. I know this because of my own experience as a parent, and because of the parents that I’ve worked with for the last 24 years. Just recently, I had a phone consultation with a parent who was confused, because she knew that she was accepting and allowing her child’s feelings. And this child also had a younger sibling that threw him off balance, as it does every child. It’s really a heart wrenching time for a child. And she knew that she was accepting his feelings, but the ones that she was accepting were the ones that were clear to her, which were when she would verbalize to him how difficult it was to have a sibling. And he would seem to agree or sometimes share specifically about that. Also, when he had a big crying spell, she was able to hold space for that. But then we got into specifics, and she shared a number of interactions that she had with her child in which she didn’t realize that she was invalidating his feelings, dismissing his feelings, rejecting his feelings. We’re not going to be perfect, that’s okay, but some children need to be seen in these moments even more than others, because maybe they’re more sensitive and they have more fear. 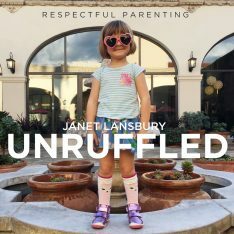 Some of the examples that this parent gave that I was able to help her see were that her child would say, “I can’t put my shoes on,” or “I can’t wash my hands before dinner.” And the mother, believing that she should be encouraging his independence, would say something like, “You can do that yourself. You know how to do that. Yes, you can.” And this boy could do those things himself, but what he was asking for was to be seen in his overwhelmed state. What he was asking for was help. He couldn’t do it then. He needed that connection and somebody to understand and help him through. There are other common ones that we miss. These little things that children say that don’t seem to make sense. They seem unreasonable. Or sometimes it’s the responses that they have to things, emotional responses, that just make no sense and they get us angry, and they seem bratty. We’ve all been there. There’s no shame in this at all. It’s hard to see when a child rejects the food that you made especially for him or says, “I don’t want that baby to even look my direction.” Or says that he hates his teachers in preschool, when these parents know quite well that he has bonded with them and he does like them. It’s these random expressions of emotion that we tend to push back on, because they really don’t make sense, and it is harder to have an attitude of empathy towards behavior that seem bratty, mean, angry. We will naturally put up defenses to that ourselves, or get angry, or frustrated, or annoyed. It’ll be hard to give our child what they need. Understanding is a challenge for all of us. This is a process of being in a relationship with a child or children who, again, can seem very cognitively advanced but they’re very, very immature in the way they handle their feelings, and it takes time for them to develop this and it takes a lot of modeling on our part. Every time we get dysregulated ourselves in these situations or we lash back or we get impatient even, we’ve now, without meaning to, created more fear and disconnection. They don’t understand me, they dislike me, they’re against me, I’m alone and I’m in a really, really scary place inside myself. Attaining that overall attitude of empathy toward our child is one of our biggest challenges as parents. There’s behavior that we can all understand a little bit more readily as dysregulated behavior: yelling, screaming, lashing out in terms of hitting, kicking, throwing things. It might be easier for us to relate to that as a tiny uncomfortable little child. But when children do these things that seem more intentional it’s much harder. But it’s coming from the same place as that really obvious lashing out. I would look at what’s going on and really consider how it got to this point. I wouldn’t spend a lot of energy thinking about telling our child how wrong this behavior was. I’m sure as he was doing it he was feeling how wrong it was, and he kept doing it. That’s a lot of discomfort inside. I would forgive him. I would work on building a bridge back to him, which we can certainly do at any time. It usually doesn’t take much, because children want it so badly. They welcome it. Shifts can happen almost immediately. I would look at the way I’ve been responding, how I’ve been perceiving my child, because that will dictate how I will respond. I would look into my heart and see what I really feel about him lately. Children are definitely at their worst at this time of life when there’s a new sibling. We will probably never see our child in a less attractive light. Feel for him, if you can. Know that he did not want to do this. He doesn’t know himself why he did it, I’m sure. It’s not a reasonable act. I would bring him back to you after forgiving him and then forgiving yourself for any missteps you might have made, because we all make them. And one of the incredibly wonderful things about children is that they will show us where they need our help — what we need to fix. I think the challenge when something like this happens, or even if it’s on a daily basis that children just seem to be acting out and treating us so horribly, the challenge is to peel off those layers and really see the vulnerability, to see that the further our child is pushing us away, in terms of their behavior, the more desperate they are for us to bring them back to us with forgiving hearts wide open. I don’t know if that’s what these parents wanted to hear or anyone wanted to hear, but that’s what I believe. I hope it helps. Thanks you so much for this podcast! It made my heart sink, as I recognised our family in so much of what you described! Our son “misbehaves” with such intent, on a daily basis, not to the extremes that this boy went, but I can feel in my heart that he is reaching out for help. I am having a hard time staying calm and unruffled in the moment, and keeping my perspective on a regular basis, but with some practice I hope I am on the good path. Although way too slowly – our young son will soon be 3, and we are still not back to the same warm, trusting relationship we had with my firstborn (who is 6). We will probably never go back to what it was. 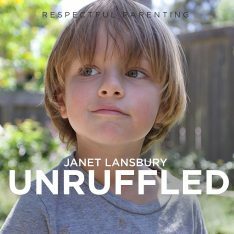 But podcasts like this make me keep faith and remember my resolve in changing my perspective and getting to a new place of trust with my son. Yes, this approach makes total sence! A good reason like He doesn’t like the feel of the food etc. Anyway thanks again and I’m sure there will be no backlash! Thank you so much for this. I mean, really. 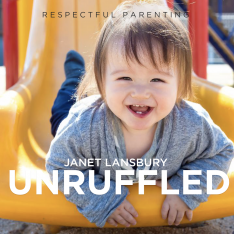 It’s encouragement to keep working towards being unruffled with our 4-year old. We have a 6-week old at home and while he’s been very sweet with her, I’ve have bore the brunt of his anger with almost every evening including him punching and kicking me. I have such a hard time keeping it together because it all makes me so sad. I miss my sweet boy and I don’t always have the wherewithal to keep calm and unruffled with him when he lashes out. Maybe if I read this each morning that would help. Thanks for encouraging parents to forgive ourselves and keep moving in the right direction. Connecting. Thank you! I am a SAHM and I just couldn’t believe I wasn’t giving my daughter enough attention (the connecting kind) and when I was honest with myself I knew it was true. I was really sad, but, as Taryn mentioned, I forgave myself and got to it: I make better boundaries so I can get my Me time and then I sit with her and color. I made time to play out back with her, rather than read a book happy to have her running and playing imagination. Yes, she can occupy herself, but, wow, when I am there she just beams with her whole body. I also am sure to hug and being in contact with her and let her get her emotions out. I have more energy for this because I got better with my boundaries and getting my space. I am not perfect—I forget to rest enough—but I am more aware and less a victim to the situation. Thanks Janet. I wish I could truly feel this unlimited empathy! My daughter is 4, she is so smart and can be very expressive. Sometimes she tests repeatedly, creatively until my calm starts to disappear. So I wonder when the child has an endless supply of testing behavior, what is going on. She does tend to save that up for me, it can be intense. I’m not always great at the10th thing as I am the first 9… anyway I will work on connecting to begin with, maybe I’m not doing that!